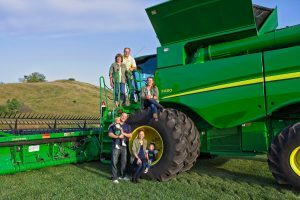 , April 10, 2019 — FARGO, N.D. — Valley City farmer Monte Peterson was struck by the importance many cultures place on soyfoods while on a recent trip to China. As vice chair of the U.S. Soybean Export Council, Peterson participates in global trade missions working to build preference for U.S. soy around the world. This particular morning, while Peterson enjoyed his cup of coffee, his counterpart from China grabbed a cup of soymilk that he’d pressed from a small machine that ground soybeans. “Soy is a big part of their culture and a valuable part of their diet,” Peterson says. It’s not just people in Asia who include soy, for many North Dakotans, soyfoods are a regular part of their diets. 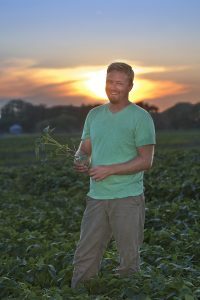 Jamestown farmer Jeremy Rittenbach not only raises food-grade soybeans that will be exported to Asia, he and his family also enjoy eating meals that include soyfoods. “We’re not vegetarian, but I was raised eating some vegetarian meals, so soyfoods have always been a part of our diet,” Rittenbach says. Veggie sausage links and patties are family favorites, as are other items such as snacks like edamame. Rittenbach grows a specific type of soybeans that are used to make tofu. He also grows natto beans, which are fermented to make a traditional Japanese dish. He has grown food-grade soybeans since the early 2000s, but has raised them consistently for the past decade. Because he grows specific soybeans for food uses, management and seed separation are important to ensure that Rittenbach delivers exactly what his customers want. It’s the same care he gives the rest of his crops. Peterson also focuses on the management and sustainability of his crops because they’re also part of the food system. Consumers world-wide are not only concerned with supplying food for their families, they’re also concerned with how that food is produced. 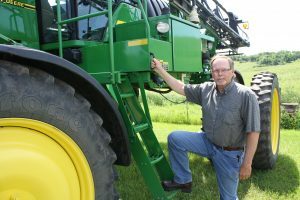 Peterson says growing crops like soybeans sustainably, by conserving resources, is a part of everything he does on his farm. Peterson says U.S. farmers have a strong sustainability story to tell because since the 1930s, the United States has had a Farm Bill. Many programs within the Farm Bill are tied to conservation compliance to address the need to protect natural resources. “That’s not something farmers in other parts of the world can say nearly as well as we can,” Peterson says. Worldwide soy production is increasing, in part, because the global population continues to expand. It’s estimated the world’s population will grow to 9.7 billion people from its current 7.7 billion by 2050. That’s a lot of additional mouths to feed on shrinking farmland. There is already strong global need for protein and soy will play a major role in meeting the additional demand. Soy is not only a healthy food option for people, it’s a primary ingredient in the diets of poultry, pork, cattle and even fish. That’s not by accident. Soy contains essential amino acids and energy that animals need to grow, thrive and reproduce. That’s why soybeans and soybean meal are sought the world over to feed animals of all kinds. Supermarket aisles are filled with great soy products. Soy can play a part in any healthy, well-balanced diet, as they nourish the body with high-quality protein that is low in saturated fat and cholesterol-free. 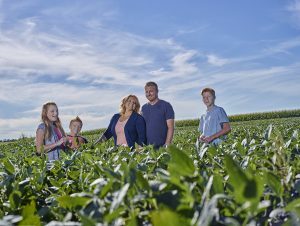 We invite you to learn more about North Dakota’s soybean farmers by going to the North Dakota Soybean Council website at www.ndsoybean.org. Story and photos by North Dakota Soybean Council.